While some agricultural projects focus exclusively on output crops and profitability, a few elite companies acknowledge the big picture. Showing heightened sensitivity to our environment, this innovative European company strives for sustainability through natural, mature hardwood tree reforestation, while also replenishing and protecting the natural surroundings. With their understanding of climate change threats and insider expertise in the luxury food market, these folks stand out. Did you know that commercial farming requires nearly 40% of all water consumed in Western Europe and exhausts natural minerals, richness, and structures of the soil? This can lead to flood hazards when the soil is washed away during landslides due to land instability. Trees provide solid root structures with low water usage and minimal impact on the soil while also stabilizing it. My pioneering friends are acquiring land that others don’t want to produce a highly desirable agricultural crop for decades to come, leaving sustainable hardwood woodlands thereafter. Adding value to our environment gives them as much satisfaction as producing the finest luxury food in the world, which in turn adds value to society. What’s a truffle? Not to be confused with the chocolate confection, these truffles are the fruiting body of an underground mushroom or tuber. Certain tree roots need specific spores to form truffles. Usually these spores are spread by fungi-eating animals, but that method is random and uncertain. This company has perfected a natural, pure inoculation of the tree roots under laboratory conditions, which ensures the trees have no competing spores at the time of planting for the maximum chance to develop. Although several tree species can host spores, these experts only plant oak with a specific network of spores achieved by mapping the DNA of the second most valuable truffle in the world—Black Perigord Truffles. Why cultivate the world’s second most valuable truffle? Because it is the most successfully cultivated truffle. Also, the French countryside chosen for this project provides the perfect soil and climate conditions for maximizing crop levels of this type of truffle. Their state-of-the-art operation ensures that each tree receives its own bar code tag to carefully record all of the inputs and applications from acorn germination through spore inoculation to the hand planting of the tree. The data gathered includes all field treatments, irrigation levels, and harvest details throughout the tree’s life. Luxury food, like other luxury items, moves you. Examples include Kobe beef, saffron, pâté de foie gras, and of course truffles—the most expensive food by weight on the planet. The market is an intimate affair—growers and buyers know each other well. In this small community you need to be connected to the best customers to be successful. There are no trading reports or platforms, no global market studies, no NASDAQ nor NYSE symbols for truffles. Only insiders know the best truffles and how to make a profit from them. You don’t need to know the best location, which tree to plant, or even which spores produce these truffles. That’s where this developer comes in. They do all the work for you. You don’t buy the land itself, which is a huge benefit, because it would be expensive and tax-inefficient to take title to French land, especially parcels of this size. This company has designed a tax-efficient structure that gives investors the security of an asset-backed investment within the structure. Speaking of tax implications, your truffles are also income-tax-free for the first 15 years from the date your trees are planted. After that, French law imposes a tax of 63% on the income from the truffle crop. So how do you get out at year 15? Your end-buyer is already in place. Negotiations with two French merchant banks and two European boutique pension funds have established an exit price. These entities have special tax status so they can purchase the trees in a tax-efficient manner while you receive a solid exit price. All the while, this valuable asset continues to provide decades of income potential, so it’s an overall win-win. This fully asset-backed investment has no debt. Land is held in a non-trading special asset-protection vehicle that includes insurance against tree failure. The company even offers tree-for-tree replacement in the first three years as part of the investment cost. The company itself has no debt nor liabilities. Currently investors must hold their trees for a minimum of five years. You will definitely receive a harvest by the fifth year, but you may see production in as few as two years. Your investment gives you a 15-year license to the trees, and cropping rights to the Black Winter Truffles that will grow on your trees’ roots. The plan ensures specific tax benefits if you sell the trees before the 15-year deadline. All returns are free from withholding taxes. Investors will receive 80% of the profit generated from each year’s crops sales while the company keeps 20% as its management fee. When the trees are sold, the investor and the company will share evenly in that profit. This arrangement ensures shared risk values and keeps the management company’s interest fully aligned with the investor’s desire for profit. Net returns will be paid annually, depending on harvest dates, but no later than May 31st of each year. Investors will also receive annual reports of harvest yields and payments, plantation management and development, and quarterly or seasonal newsletters. As I reported in Overseas Property Alert earlier this year, the minimum investment was 100 trees. However, a few months ago, our Global Property Advisor Members were offered the exclusive opportunity to jump in with half that many. I have finally been authorized to extend the special offer to you, my Overseas Property Alert reader, for a limited time! As a special favor to Live and Invest Overseas, and specifically to you for being a reader of OPA, the developer has agreed that you can also become a truffle investor with a purchase of only 50 trees. The current price for 50 trees is 19,071 pounds sterling (US$24,400). The initial investment must be in pounds as this is a U.K.-based company. Profits, however, will be paid in euros, or dollars if requested. Own an investment in France but free of French income tax burdens. Receive the expert services of the world’s leading truffle-tree science company. Partner with the world’s most successful tree inoculation experts. The trees are grown from acorn at a renowned plant research facility near Barcelona. Various exit plans with flexible disposal of your plantation in lots or in whole during the course of the investment or at the 15-year mark. Each investor receives 80% of the crop share and 50% of the final tree sale price at year 15. Be a part of the heritage of one of the world’s finest foods. 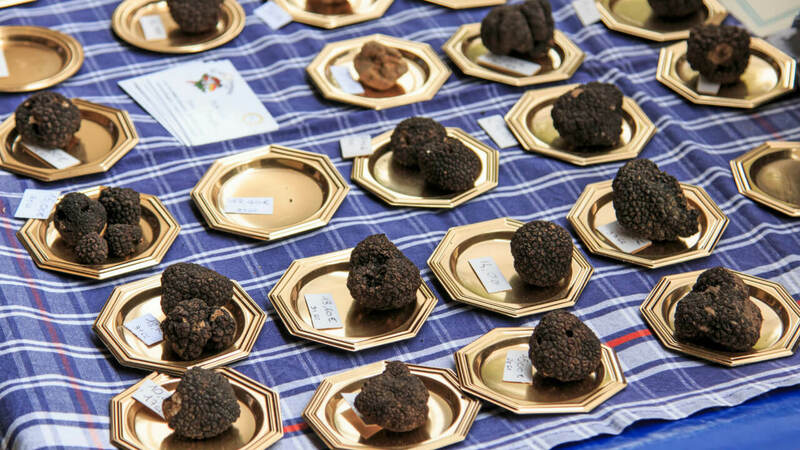 Take advantage of the proven best geography and soil conditions for the famous French Black Winter Truffle. Receive personalized, vacuum-packed, fresh truffle deliveries. Enjoy investor-only truffle discounts, visits, and holidays. Realize ecological, environmental, and sustainable returns. In the past, initial crops were typically delivered between 9 and 15 years after initial tree planting. However, in 2014, the first crop was achieved on 5-year-old trees. Most recently, in the 2016/2017 harvest season, an initial crop was harvested from 2-year-old trees in an experimental plantation. The expected rate of return on investment is 24% annualized, but keep in mind the first few years will yield low cash flow as the crop is taking root. By year 12, the annual cash flow is projected to be as much as 75% of your initial investment, and this will hold true until you sell your trees at year 15. The projected IRR is 19% overall. A full annual chart of returns is available from the grower. Click here to request your copy. These truffle producers cannot keep up with market demand. Currently truffle supplies average 40 tonnes per year, but the market is demanding 1,000 to 2,000 tonnes per year in this long-established global market with both wholesale and retail arenas. This is your chance to cash in on an excellent return on investment, from a relatively small initial payment, for a product with a supply that isn’t likely to catch up with the demand before this opportunity is over. Contact these truffle pioneers here.